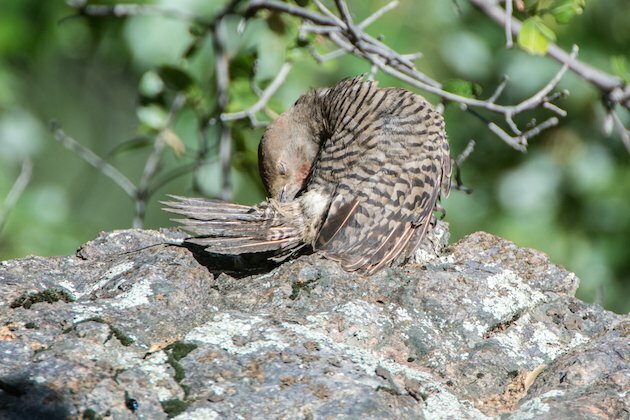 Unlike cavity nesting ducklings which hatch precocial (eyes open, covered with down and ready to go), most cavity nesting birds hatch altricial. They are usually naked, blind, unable to move around, and completely dependent on their parents for food and temperature regulation. 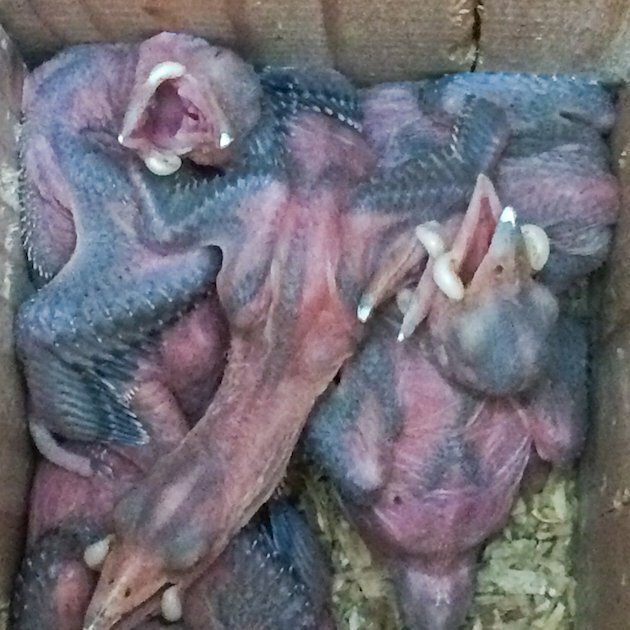 As you can see, these 10 day old nestlings from a previous post are just beginning to open their eyes and huddle at the bottom of the cavity. They are probably being feed ten times a day. Click on photos for full sized images. 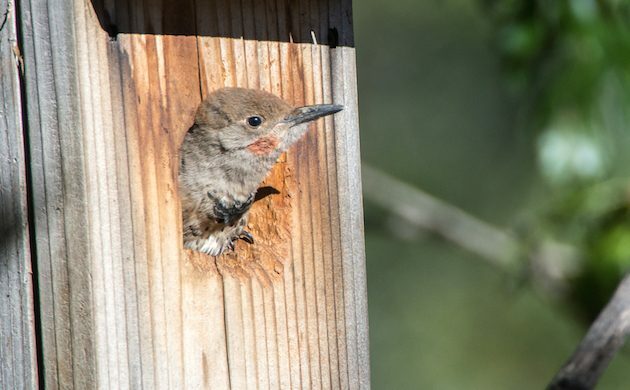 Two weeks later the nestlings array themselves around the circumference at the bottom of the nest cavity with their chins and throats pressed against the wall. It’s getting quite crowded in there and the adults are probably making 40 to 50 feeding trips a day. 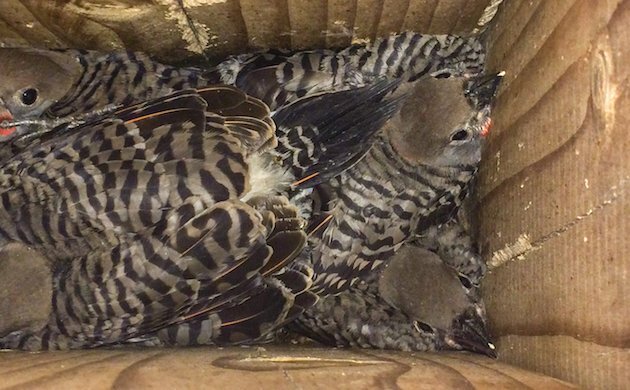 Knowing nothing yet about the outside world, these young Flickers are accustomed to being fed regularly and feeling secure inside their nest cavity. 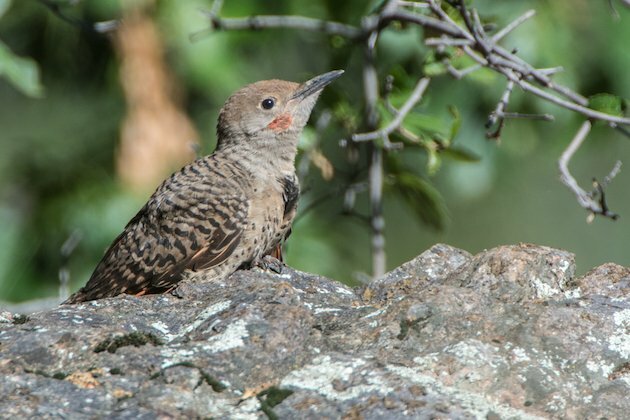 It therefore takes some coaxing by their parents to get them to fledge. Like the female Hooded Merganser in the video link above, the adult Flickers call to the nestlings to encourage them to leave the nest that has been their home for three weeks. 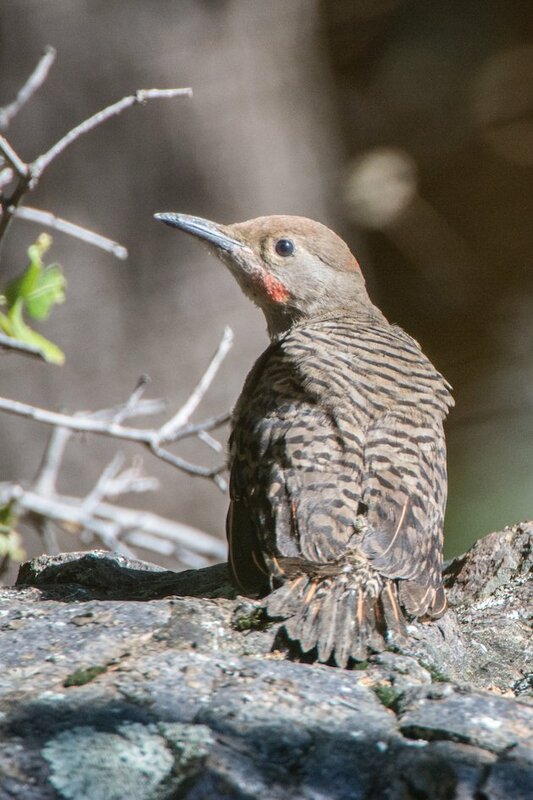 The Flickers have a much tougher task than the adult ducks did because the ducklings were never fed in the nest and only spent one night there. 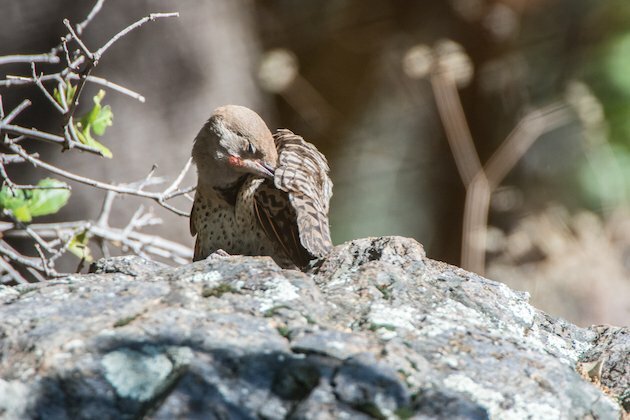 In the following video you will see the female Northern Flicker near the nest entrance and hear the male calling from nearby. 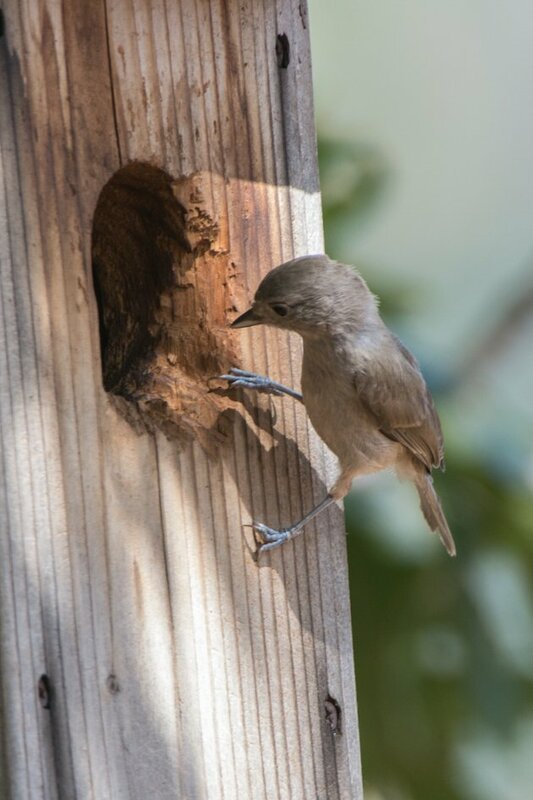 You can also hear a nestling tapping inside the nest box. The female hops over to the entrance and performs several mock feedings, then flies off. Many cavity nesting species perform these mock feedings to coax their young from the nest. At this point a male nestling (probably the oldest of the brood) pops his head out and begins begging for food. 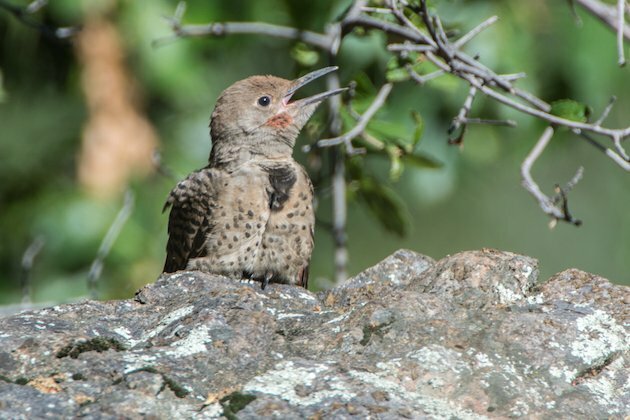 Mom comes back to the entrance for more mock feedings and flies away. The young male then, finally decides to take his maiden flight! A short while later, a second male nestling makes his awkward flight from the nest box, landing about fifty yards away amongst some trees and rocks. and calls to his parents. After striking a few poses, he flies off in the direction of his mom and dad’s call.